« Ah Spring – AhChoo!!! Safe, high quality home canned foods begin with the right equipment, used properly. Why risk losing your time and food dollar through spoilage? Check and assemble good equipment before the season begins, then maintain it well. Check jars and bands. Discard chipped jars and rusted or distorted bands. Have pressure gauges checked. Check with your local Extension office for Food Preservation Workshop or pressure canner gauge testing dates/times. Check seals on last summer’s produce. Make plans to use up last summer’s produce (both frozen and canned) to make room for new products and to prevent waste of food. Check files to make sure your food preservation information is complete and up-to-date. I have several peanut butter, pickle and quart-sized mayonnaise jars which I would like to be able to use for canning. Is it safe to use these jars in a boiling water bath canner or a pressure canner? NO! Use only standard canning jars for home canning as these jars have been specially annealed to withstand the heat necessary in the home canning process. However, these make good refrigerator storage jars, are a perfect solution for your picnic packaging needs, or can be recycled at your local recycling center. How long is it safe to store canned food? For optimum quality of food, plan to use home-canned food within one year. After 1 year, quality of food goes down, but is still safe as long as the seal is still intact and there is no sign of spoilage. Whatever the age, ALWAYS boil low-acid, pressure canned food a full 10 minutes. Twenty (20) minutes for corn, spinach and meats) to destroy any botulism toxins. DO NOT taste prior to boiling. Which pressure canner is more accurate– the kind with a dial or the one with a weight control? Both are accurate if used and cared for according to the manufacturer’s instructions. Some people like numbers on a dial; others prefer the sight and sound (“jiggling” noise) of the weight control. Do I have to use a pressure canner to can low acid foods such as green beans, corn, potatoes, etc.? YES, YES, YES!!! Low-acid foods must be canned in a pressure canner. 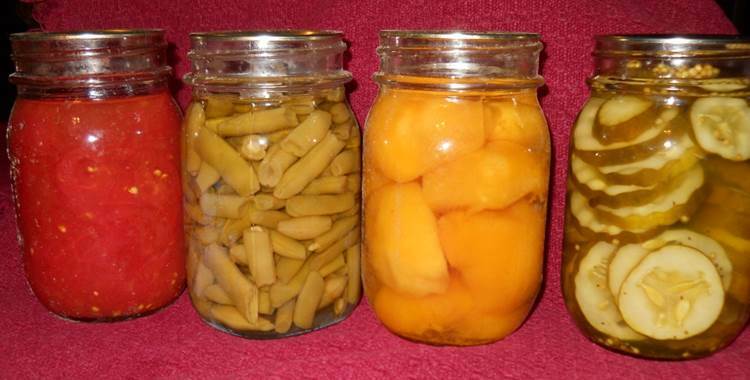 Whether food should be processed in a pressure canner or boiling-water canner to control botulinum bacteria depends on the acidity of the food. Acidity may be natural, as in most fruits, or added, as in pickled food. Low-acid canned foods are not acidic enough to prevent the growth of these bacteria. Acid foods contain enough acid to block their growth, or destroy them more rapidly when heated. The term “pH” is a measure of acidity; the lower its value, the more acid the food. The acidity level in foods can be increased by adding lemon juice, citric acid, or vinegar. Low-acid foods have pH values higher than 4.6. They include red meats, seafood, poultry, milk, and all fresh vegetables except for most tomatoes. For more information – check out the National Center for Home Food Preservation’s website at http://nchfp.uga.edu/. OSU Extension’s page on food safety: http://fcs.osu.edu/food-safety. National Center for Home Food Preservation – www.http://nchfp.uga.edu/. Written by: Cynthia R. Shuster, CFLE, Extension Educator, Family and Consumer Sciences, OSU Extension, Perry County, Buckeye Hills EERA. Reviewed by: Pat Brinkman, Extension Educator, Family and Consumer Sciences, OSU Extension, Fayette County, Miami Valley EERA.